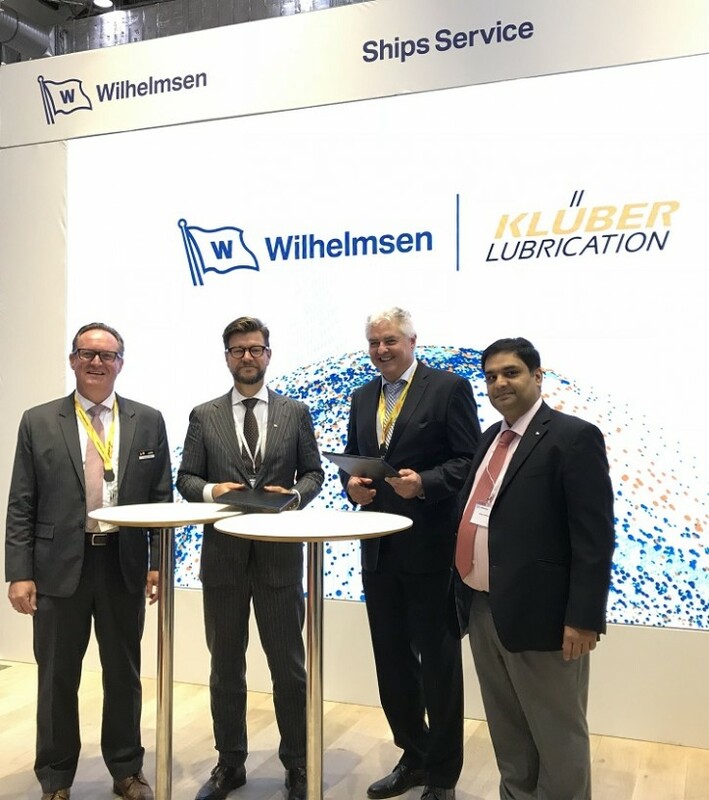 Klüber Lubrication and Wilhelmsen Ships Service have signed a close distribution partnership, with Wilhelmsen becoming a global partner for marine lubricants from Klüber Lubrication. With the deal, signed at the maritime industry’s largest exhibition SMM Hamburg, Wilhelmsen will strengthen its existing product portfolio in a key area, adding high-performance speciality lubricants to its global offering. Kjell Andre Engen, EVP Marine Products, says, “Joining forces with Klüber Lubrication is a real coup for us, it enables us for the first time to offer customers market leading lubricants and a wealth of in-depth product specific expertise. A key area previously missing in our portfolio, we are thrilled to also now be able to provide customers lubricants, and the world’s most sophisticated ones for that matter, through our unrivalled global network”. "We always had an eye on each other since we both met at the last SMM. With mutual admiration we observed the successes and outstanding performances which both parties brought to the market with passion and dedication ", says Dieter Becker, Head of Global Business Teams at Klüber Lubrication. To this end, despite the ink being barely dry on the agreement, training on speciality lubricants has already begun for Wilhelmsen staff. With the largest maritime network in the world Wilhelmsen Ships Service is active in 2,000 ports, in 125 countries worldwide. Supplying marine solutions including the Unitor brand of products, Timm ropes, Unicool refrigerants, and Unitor and Nalfleet marine chemicals, along with a complete portfolio of ships agency services and maritime logistics, last year we made product deliveries to 27,500 vessels and handled 75,000 port calls. The maritime industry’s trusted partner in port, on board and offshore, our wide portfolio of products and services are available in every market and region, to every conceivable vessel type.